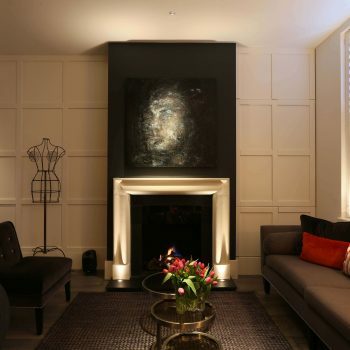 When it comes to lighting for a living room, it is essential to think of the furniture arrangement first. Once you know where your key pieces of furniture will be, you can look to position your light fittings in order to enhance the space. 1.Start by looking at the first and most practical circuit. Consider positioning LED downlights that are angled towards the curtains, artwork and any joinery so that the reflected light comes back into the room, enhancing the feel of space within the room. Always try and avoid a grid of downlights as this only serves to make a room look flat and dull. Use the Polespring LED downlight for its low glare and excellent colour rendition. 2.Think about layering the lighting and adding a layer of uplights. Discreet low glare uplights such as the Lucca or Luccini can add a magical touch to window reveals or fireplaces. They come in a variety of finishes too so can be suited to any project style. 3.Then think about adding a layer of warmer lighting in the form of table lamps with shades all plugged into a 5 amp circuit. The warmer light from a halogen or incandescent lamp is of much more comfort throughout the winter months than cold compact fluorescent bulbs. These are best when dimmed simultaneously on the same circuit and create a wonderful cosy and relaxed feel to the space. Using 5 amp floor boxes that can be hidden under sofas are an ideal way of hiding any lingering cables too. 4.It is important to create focus within any room. Quite often the simplest way to achieve this in a living room is to simply pin point a coffee table or decorative object with a narrow beam of light. The Polespring offers a 10 degree beam of light, ideal for creating a wonderful pool of light. 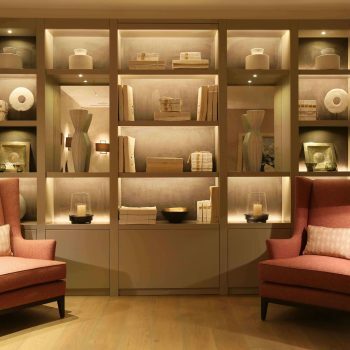 5.Introducing lighting into shelving adds further interest and depth. Front lighting using an LED tape such as our Contour HD24 works well lighting both objects and books, or consider downlighting with the Etta Eyelid Under Cupboard light to create a focused light onto individual items. For added drama and depth, consider back lighting which silhouettes simple objects beautifully. 6.Finally, it is important that each circuit is dimmable within the room. This way you can use the lighting to serve all moods and purposes and you are able to create endless numbers of scenes.